This is for all you travelers looking for gifts or even a product to add to your travel collection. The set I got to check out is a passport and luggage tag set. 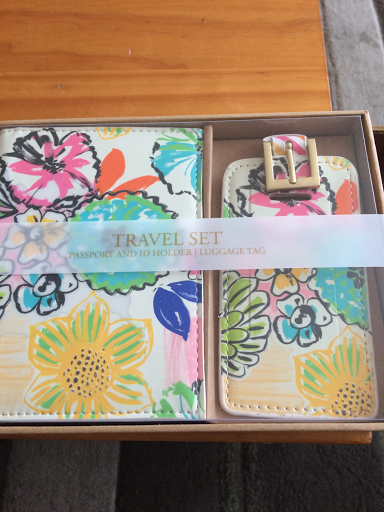 In a garden theme it's a cute set to get because you don't have to buy the luggage tag and passport separate. It had a nice feminine touch to the set making your luggage stand out. It's packaged nicely so you can gift it to someone. I know someone that's gonna travel soon so I will give them this lovely gift. One of the items is a luggage tag so you can add your information inside so your luggage won't get loss so what's cool is it's water and stain proof all you need is a damp cloth and just wipe. Protecting those valuable documents. The next item is a passport holder you can have money your passport and some credit cards and I'd all tucked away in the holder. Like i said it's water proof you don't want it to get damage you have valuables inside. It's a cute set I recommend this to all the woman in your life that like to travel they should definitely go get this set. I was given a product for my honest review.